The shrinking size of proton therapy technology. Proton therapy systems have traditionally required an area about the length of three football fields and three stories in height. Accommodating technology of this size is challenging. For many hospitals that have chosen to provide proton therapy treatment, they have had to purchase land and/or build a free-standing center. This comes at a high cost – one most hospitals are unable to afford. The good news is that proton therapy technology is getting smaller. For a single treatment room, the Radiance 330® Proton Therapy System requires an area smaller than that of a basketball court. This space is able to accommodate not just the synchrotron and beamline, but also the treatment room, control room, and all necessary concrete shielding. In addition to requiring less space than traditional proton therapy systems, the compact, modular design of the Radiance 330® makes it possible for it to be installed where other systems cannot be installed including, above-grade or within existing space. ProTom installed Radiance 330® inside two empty linac vaults, three levels below ground, within a hospital’s Department of Radiation Oncology without impacting the daily operations of the Department. Radiance 330®’s innovative design allowed it to be transported to the hospital via a 26-foot two-axle truck. Once at the hospital, only one piece of non-standard equipment was needed for installation and no facility hatch was required. In fact, the system was transported via pallet jacks and forklifts inside corridors, freight elevators, and down an elevator shaft. 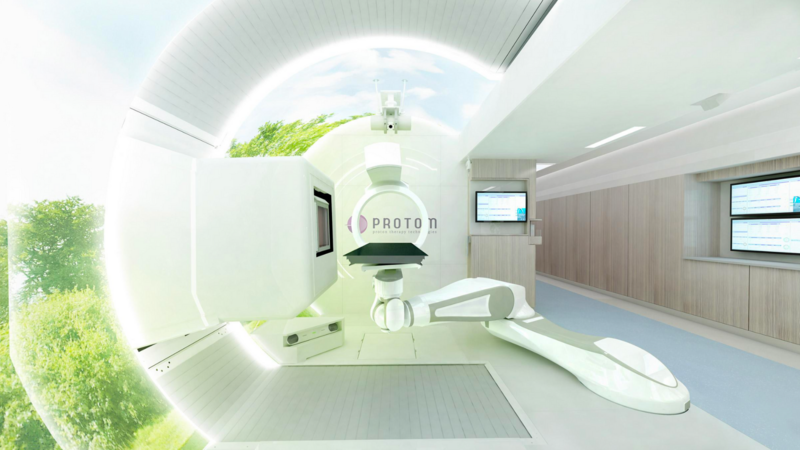 The Radiance 330® has been called the future of proton therapy technology. Interested in learning more about compact proton therapy technology? Download the Radiance 330® brochure.